David will show you how to look inside yourself and make positive changes that will chart your course to success. You complete the DiSC (Dominance, Influence, Steadiness and Compliance) assessment, providing a comprehensive overview of your behavioral style. After analyzing the results, David tailors a rigorous plan culled from the breadth of the business, balancing essential skills with self-development tenets—enabling you to stretch beyond your comfort zone and achieve higher-than-imagined numbers. Through a frank discussion with David, you recognize—and accept—your authentic self, including your strengths, challenges and self-perception. Then you agree to a series of behavioral changes, to which you are held accountable. You and David meet regularly (usually weekly by phone or in person) to ensure that you’re making meaningful progress with critical goals such as better prospecting and stronger closings. At the same time, he helps you hone key skill sets, including persuasion, interpersonal communication, flexibility, goal-setting, organization and time management. 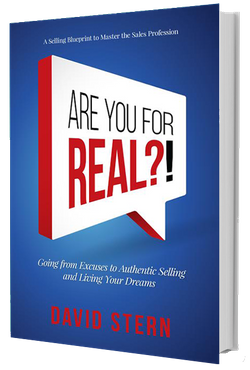 If you’re ready to break out of your bullshtick prison (comfort zone) and start striving toward your dreams, then get real—and contact David!